This holiday season get ready to make a splash with Hydro Strike! In this head-to-head pinball game, you’ll need fast flipping fingers to shoot the ball into your opponent’s goal. Score and your opponent will get sprayed in the face with water! Since a sprayer is aimed at both players, you have to strike quick when you play, or you’ll get sprayed! The first player to score 5 times wins. Will you win or will you get wet? For 2 players, ages 7 and up. This would make a great holiday gift for the kids in your life, kids you know or any kids that you need to get a gift for this year. Consider getting a game like this for this holiday season. 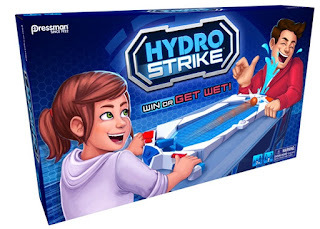 Hydro Strike retails for $14.97 and is available from www.amazon.com and www.target.com and Target stores. Like Pressman Toy on Facebook: https://www.facebook.com/PressmanToy/; Follow Pressman Toy on Twitter: @pressmantoy; Follow Pressman Toy on Instagram: https://www.instagram.com/pressmantoy/ and Subscribe to Pressman Toy on YouTube: https://www.youtube.com/user/pressmantoy.